Put our 30 years of experience to work for you. We design fly fishing vacations and island adventures to suit your needs. All our services are free. Welcome to the Bahamas Fly-Fishing Guide web site, 2019. We add updated news and information on a regular basis to this site, so please visit us often. We invite you to e-mail us with your comments, suggestions, questions, or island news. Please see our BLOG for an update on the AMAZING ADVENTURE we offer this coming season October 15, 2018 thru June 30, 2019 - a unique Eleven Angling Mothership operation on the West Side of South Andros to access the Bahamas best bonefishing and tarpon fishing. And as always, we work only with the best Bahamian guides at every location we promote. On the Eleven Mothership our exceptional team of Bahamian guides are led by Captain Marvin Miller and Captain Ornald "Shine" Greene. Only at Eleven can you fish some of the most remote land-locked lakes for bones tailing in 2 to 5 inches of water on Stand-up Paddle Boards. It's a thrilling visual experience. And we're exploring more lake systems every week for tarpon, permit, cubera snapper, and big snook. Visit our BLOG often as we will be making regular posts on the Mothership throughout the season, plus posts from other hot spots around the Bahamas. 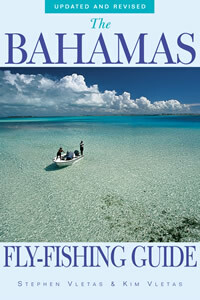 BAHAMIAN FISHING LICENSES - Many of our readers and friends ask about DIY and fishing licenses. All visiting anglers, non-Bahamians, must purchase a flats fishing license to fish with a Bahamian guide and or to fish on you own. Click here to go to the Bahamas government page to purchase your license online. We know many anglers love to fish on their own, and a number of anglers can't afford to fish with a guide every day....but we highly recommend that you fish with Bahamian guides as much as you can. We fish with Bahamian guides, many of whom are our long-time friends, every day we fish in the Bahamas. See the island pages for the guides and lodges we recommend. Or drop us an email to ask for additional recommendations. The Bahamas offers the best bonefishing on the planet, plus great options for tarpon and other species; permit, jacks, snapper, barracuda, sharks. And offshore; dorado, tuna, wahoo, sailfish, marlin. Want one island that has it all, including shots at double-digit bonefish--that's Andros Island. Want chances at double-digit bonefish and fun nightlife--Grand Bahama. You get the idea. We use our extensive experience to personalize all trips to your specific needs. The beginning of your ideal vacation is just a click away. As a full-service travel agent, we can also book your flights, plus hotels in Florida and Nassau if stop-overs are needed when traveling to the Out Islands. Email Stephen directly to begin planning your ideal trip, or visit our Travel Planning page. As always our bookings services are free. You pay nothing extra, so why not leave it to us to plan and book your trip. We can save you time and money, and we can guarantee that you will fish with the best guides. And if you are traveling with non-anglers, we offer many locations that combine great fishing with stunning beaches, snorkeling, diving, luxury accommodations, fine dining, shopping, and more. A mere 50 miles off the southern coast of Florida, the Islands of the Bahamas beckon—to anglers and adventure travelers alike. They are sirens singing their ancient irresistible songs promising peaceful relaxation, endless stretches of pristine beaches, glistening turquoise waters, delicious food and drink. And of course there are a diversity of angling challenges, a chance to match wits and skill with the world’s finest gamefish. This total experience is the essence of fly-fishing, and we’re all searching for that experience . . . the one that will lighten our souls forever. Fishing has long been an integral part of the Bahamian lifestyle and culture, in no small part due to its physical makeup and geography. The Spaniards called the region Baja Mar, the Shallow Sea, and it is one of the most magnificent saltwater fisheries in the world. Practically speaking, the fishing opportunities are divided into two distinct types. The most popular with fly-fishers is the shallow-water flats fishery. The blue-water, or offshore, fishery has been recognized as sensational by conventional anglers for years and is becoming more popular with fly anglers with each passing season. Flats species consist of the big three: bonefish, tarpon, and permit; plus barracuda, lemon and blacktip sharks, jack crevalle, mutton snapper, and mangrove snapper. The most abundant gamefish to pursue over the inshore reefs include cubera snappers, grouper, a variety of jacks, barracuda, numerous species of sharks, sierra and king mackerel, and amberjack. Many of the best flats regions have been famous for years, while others are just now being explored. Bimini is a legendary flats destination for anglers hunting big bonefish. Look in the International Game Fish Association record books and you’ll see that Bimini is well represented. At the East End of Grand Bahama, Deepwater Cay has established itself as one of the premier bonefishing lodges in the world. On Andros, the North and Middle Bights have been visited by the rich and famous since the 1930s. The Bang Bang Club on Pot Cay in the North Bight was one of the first bonefishing clubs. Treasure Cay, Abaco, serves up fine family accommodations, and delivers anglers to the doorstep of the Marls, a vast mangrove flats region reminiscent of the Everglades. Eleuthera’s Windermere Island, once an elegant retreat laced with lavish homes, fell on hard times in the 1980s and 1990s but has now made a comeback. Nearby Savannah Sound is composed of white sand flats suited to anglers who want to fish on their own. Since the “bonefishing explosion” in the mid-1990s, the Bahamas has experienced significant changes on most islands. Overall, the bonefishing industry in the Bahamas has matured. Successful lodges and guides have realized that service and comfort matter, and that catering to couples and families, as well as serious anglers, is a must. More and more, anglers are showing a desire to fish on their own without a guide. This has caused crowding on some of the more accessible flats on the islands of Eleuthera, Long Island, and elsewhere, and has created a conflict with local guides. Sometimes progress is good, and sometimes not, but the crowding and conflicts are part of the natural evolution in up-and-coming tourist destinations throughout the world. In that regard, we expect to see conversation-oriented changes coming to the islands and those will include new fishing licenses for foreigners and regulations on some flats similar to regulations on many of the rivers in the U.S. West. Before you go on your trip, ask us about the current situation regarding licenses and regulations. On the blue waterfront, the most popular gamefish species continue to be blue and white marlin, sailfish, a variety of tuna, wahoo, and dorado (dolphin). Some of the best-known areas include North Abaco, Bimini, Nassau, Port Lucaya/Freeport, and Fresh Creek, Andros, where the Tongue of the Ocean sweeps in against the flats and plummets to depths of 6,000 feet. U.S. Naval buoys off the eastern shore of Andros are phenomenal dolphin and Allison tuna magnets. Farther south, Cat Island, San Salvador, Long Island, and Crooked Island are remote blue-water havens. Some of the best blue marlin, tuna, and wahoo fishing on the planet can be experienced here. A quality that is foremost in our minds about the Bahamas is its tranquility and charm, especially across the Out Islands. The fact is, there are really two Bahamas. One is the high-profile resort settings of Freeport and Nassau. The other consists of the Out Islands, or Family Islands, where the residents are friendly and welcoming, and change happens at a snail’s pace. Out Island residents make a habit of welcoming guests. Anything you need, no problem, Mon. The simple truth is you don’t need much—a comfortable room, good food, a cold Kalik, and a place to hang out with friends and maybe tie some flies or rig some leaders. This is one of the best places in the world to relax and just live day-to-day. “Eat, fish, drink, sleep, eat, fish, drink, sleep,” becomes the hypnotic mantra. A phrase we often use is “How bad can it be in a place like this?” The settings of the Bahamas are sometimes stunning and dramatic, though more often the beauty is simple, subtle, and soothing. Clear aqua-green water, pink sand beaches, lush mangrove cays, cool pine forests, the sound of the surf as it pours over a reef, along with the abundant bird and sea life, these are your constant companions. While the people are laid-back, they also possess an old-fashioned sense of purpose. As tourism moves into the mainstream, new energy and enthusiasm are being focused on developing marinas and resorts. This has been most prevalent on Abaco and Exuma. Sandals at Emerald Bay, Exuma, a luxury all-inclusive resort and the ultra-upscale resort and residential community, the Abaco Club on Winding Bay, are examples. Both resorts feature championship 18-hole golf courses and have plans for new marinas. In spite of this, the way of life throughout the Out Islands remains relatively unchanged. Work hard, honor your family, have pride in yourself, and be friendly, seems to be the motto. This way of life has persisted for generations. It is the essence of harmony that can seep into your soul and, along with the fishing, it can keep you coming back again and again. THE FIRST THING you need to do is decide what kind of trip you want. Hard-core fishing with basic accommodations? Fishing on your own (DIY), or with top-quality guides? All guys? All girls? Couples? Honeymoon? Get the idea? ALL OUR BOOKING AND TRAVEL PLANNING SERVICES ARE FREE. We take your input, then use our extensive experience to personalize all trips to your specific needs. The beginning of your dream vacation is just a click away.